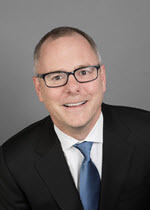 Christopher E. Kay is an Executive Vice President with M&T Bank. In this role, Kay leads all aspects of consumer banking, business banking and marketing, including more than 750 branches across eight states and the District of Columbia. He is also a member of the bank’s Management Committee. Kay joined M&T in November of 2018 after serving as Chief Innovation Officer at Humana. As a member of the management team there, he led efforts to create a new kind of integrated care with the power to improve health and well-being and lower costs for customers. Prior to that, he was the Managing Director of Citi Ventures, where he led Citi’s corporate venture capital efforts globally, as well as Citi’s efforts to redesign and scale a new customer experience across consumer banking and private banking businesses. Prior to joining Citi, Kay held a number of senior operating roles at Target. He earned a Bachelor of Science from University of Wisconsin-Madison and a Juris Doctorate from the University of Minnesota Law School.